Sometimes you only need to ask a few question and other times you need to know a whole lot more. Well ask away, there is no limit on the number of questions or responses! 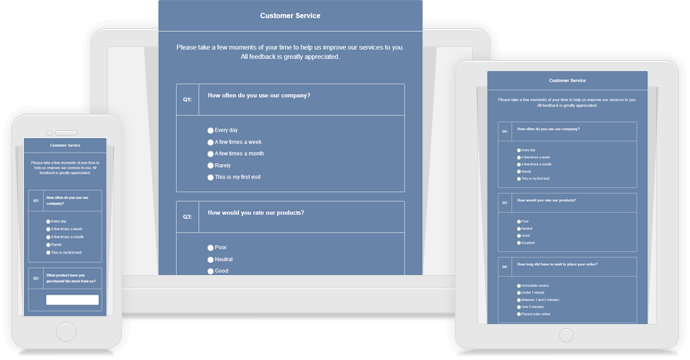 Not all questions are created equally, which is why we provide 7 different types of question types including ratings, Net Promoter Scores, single line answers, multiple choice, and more! You can add a survey invitation on ANY page of your website. Don't bother sending an email to a dedicated survey page! We give you the option to trigger an invitation message on any page of your site based on a number of different targeting options. Some surveys aren't appropriate for all user types. Maybe you want to avoid people in a hurry and only show the survey on desktop. You can also trigger based on page engagement and many other factors! You have full control over your survey invitation. Choose when you wan it to appear for visitors based on where they scroll, how long they spend on the page, or even on a certain date or day of the week! Add your logo, match the color palette with your brand, and make TruConversion surveys look like they're a part of your site! Don't just get the information and run! Add a custom message at the end of your survey with a thank you message, bonus, or a link to another page on your site. We live in a multi-device world and TruConversion has you covered. Works automarically across device and is easy to share and download. Find out the busiest sections of your webpages and highlight the sections with the lowest click ratio. Watch recordings of individual browsing journeys to see WHERE they're click and discover WHY you're losing them. Thanks to Funnel Analytics you’ll be making more sales from the traffic and leads you’re already getting. See which fields are getting filled, and which ones are causing your visitors to bounce. TruConversion Microsurveys, enable you to post a simple poll in seconds...anywhere on your site and following virtually any action.